MLB The Show 2016 dropped on March 29, exclusively on PS4. San Diego Studios added some new features to this year’s Major League Baseball video game. This year’s new additions are ShowTime, Battle Royale, and Conquest Mode. ShowTime is a new feature in Road to the Show Mode that enables you to slow down time to increase your chances at a big play. For example, if you are on the field at short stop and someone hits a line drive to the gap, you can use ShowTime to make a play on the ball. With hitting, ShowTime can be used to identify whether the incoming pitch is a ball or strike, or to slow the ball to make it easier to hit. This is a limited use feature; you only get to make one big ShowTime play in every game, so use it wisely. Conquest and Battle Royale are new additions to the Diamond Dynasty Mode in MLB the Show 2016. Conquest is a single-player game mode that is similar in strategy to the board game “Risk.” The end goal is to capture strongholds of each of the teams through numerous three-inning games. After conquering each stronghold, you unlock the ability to get two flashback players to use on your Diamond Dynasty team. Battle Royale is the online player-vs-player three-inning game-based mode. You pick your team through a 25 round draft. Each round is composed of four players, and you will select one player from each round. Once your team has been drafted, you will play against other online gamers with the ultimate goal of going on a 20-0 win streak. When you reach 20 wins, you will receive a guaranteed Diamond Player for your Diamond Dynasty team. “Grinding” innings means earning IP (innings played) for a particular team in Diamond Dynasty. After defeating the stronghold in Conquest Mode, you have to “grind” innings (meaning play a lot of games) in order to get the first flashback player. For example, you need 700 innings played with Seattle Mariners players to earn an 84 overall Michael Pineda to play on your Diamond Dynasty Team. After you unlock this player, you then have the ability to earn a Diamond-quality player. Opening packs to try and get new players for your team can be a lot of fun. But this pack opening could bring you to tears. 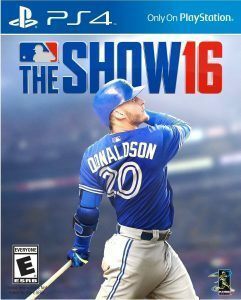 Get your copy of MLB The Show 2016 from Amazon.com with Hermit_theCrab’s Amazon Affiliate link. You can also refill your stubbs for in-game play on Amazon.